Trailhead and parking area are on Rt. 302 in Harts Location, NH. The trailhead is marked by a small sign on the south side of the road, and there is a small pull-off on the north (Saco River) side. This is 20 miles southeast of Rt. 3 and 9.1 miles west of the northern junction with Rt. 16. Mt. Tremont is the highest peak in the Moat Range. It is a broad, irregularly-shaped mass which looks very different when viewed from different angles, as its many ridges and sub-peaks disguise its appearance. A small ledge at the summit provides a sweeping view to the southwest, encompassing the Sandwich Range and Carrigain area. In the foreground of this marvelous vista is a basin-like area enclosing solitary Sawyer Pond and striking Green's Cliff behind it. To the viewer of this interesting region is transmitted the impression that the area entirely belongs to Tremont and that he is its perpetual watcher and keeper. 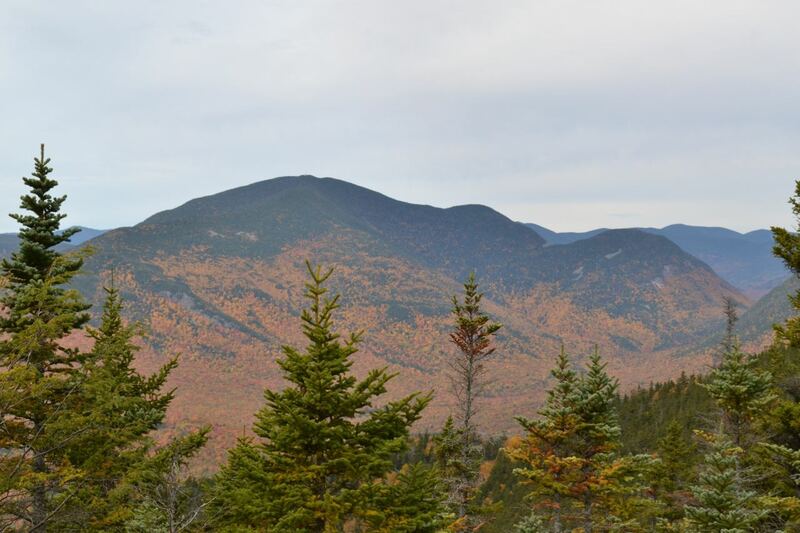 Visit the mountain in peak foliage season and you will experience Tremont's domain at its finest. This is nearly essential; DON'T miss this peak in the autumn! Mt. Tremont Trail, the shorter of two trail routes to Tremont begins on the south side of Rt. 302, a fair distance below the Crawford Notch region. A small pull-off across from its inconspicuous trail sign hints that it is a well-kept secret from mountain-climbing foliage seekers. Cross the road and jump into the woods, crossing a seasonal stream and swinging to the left. In 0.3 miles, you will meet up with Stony Brook and begin following its west bank. Stony Brook, proving the worth of its name, is ledgy and filled with rocks. Keep a lookout toward the brook for cascades; make sure to look for one cascade that is particularly interesting. This cascade pours from the top of two boulders in a narrow flow, dropping rapidly to the ledges below. As you trek further along the brook, the trail lifts higher up the bank, soon crossing a small tributary and rounding the corner of a small ridge between the tributary and Stony Brook. The trail soon climbs out of sight of the brook and flattens out a bit; you have now journeyed one mile into the forest. The path then crosses an old logging road and meanders through a muddy stretch. It continues ascending though open woods for the next 0.3 miles, slowly returning to Stony Brook. It descends a small bank to cross it, switchbacks up the other side, then crosses a second branch of the brook. The relentless ascent of Mt. Tremont's northeast slope begins now. If you are hiking in the fall, you will now be entranced by the apple-hued forest cover and carpet of fallen leaves on the footway. You can also peek through the trees at a the colors on a ridge to the northwest. Eventually, the trail begins to climb by rapid switchbacks, which continue all the way to the top. After 0.9 miles, the fall foliage bliss fades away as the trail climbs into evergreen forest. The pathway becomes steeper and much rockier. On a few of the switchbacks, and on one in particular which has a large opening, you have a good view of Mt. Washington and the Southern Presidentials, along with the trio of Stairs, Resolution, and Crawford. As you approach the top, the trail steepens significantly and the switchbacks become much shorter. At the summit, you are rewarded with the magnificent vista described previously. Your gaze is immediately drawn to the centerpiece of Sawyer Pond and Green's Cliff. This is the area that most bursts with color in the fall. Off to the left, you look down on the round bump of Owl's Cliff; the cliffs are on the other side from you. The Brunell Trail route ascends over this sub peak of Tremont. In the distance, the Sandwich Range stretches across the view. Above Green's Cliff, Mt. Tecumseh appears behind Mt. Kancamagus and Mt. Osceola is to its right. Further to the right is the impressive Carrigain area, including Mts. Huntington, Hitchcock, and Hancock. Mt. Carrigain itself is slightly blocked by trees; a more open vantage point can be found to the side of the trail a few yards before the summit.